What do I do if I've forgotten my Passcode? You can reset your Passcode for the Mobile Banking app by registering your device again. Simply select 'I forgot my Passcode' from the log on screen in the app and follow the instructions. 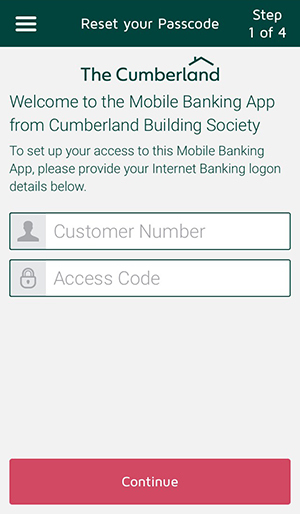 To reset your Passcode using the app, you will need your Customer Number and Access Code which you use to log on to Internet Banking. You can find your Customer Number in the welcome email or letter which was sent to you when you opened your current account. Alternatively, call our Customer Service Team on 01228 403 141, and they can provide you with your Customer Number over the phone. You can also call our Customer Service Team on 01228 403 141 for help with your Passcode.